The first ADC on February 24, 2018 was a highly participatory symposium created in an effort to bring together artists, culture workers, social change agents and anyone who knows that we can collectively create a society that is loving, compassionate, inclusive and beautiful. 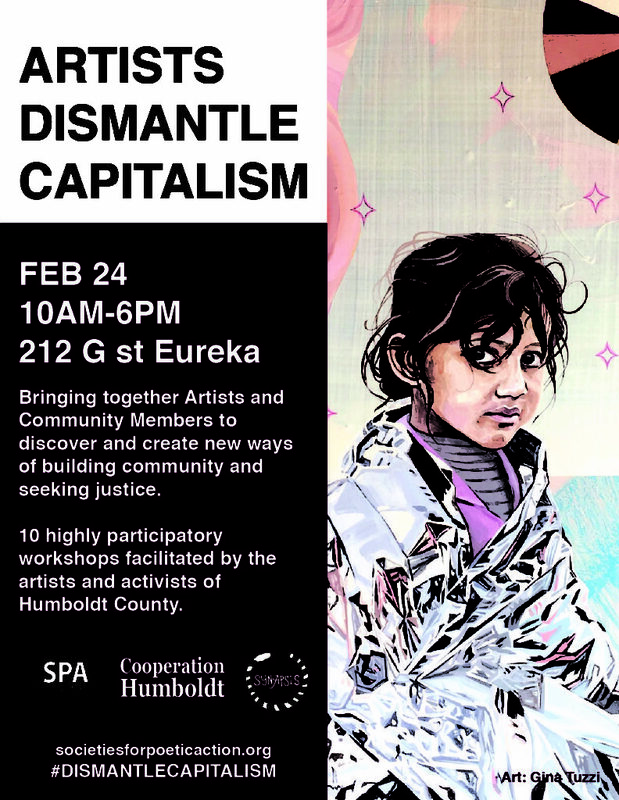 The Symposium was inspired by the experience of Synapsis Incubator losing it’s space, coupled with the release of the City of Eureka’s Strategic Arts Plan for 2017-2022. Over 100 local artists and activists participated in the 10 sessions that were offered. The Big Picture: A short (but deep) dive into the inter-relatedness of patriarchy, imperialism, capitalism and white supremacy as a way to ground our time together. Artists Union workshop: We will examine artist's experiences in the local market, determine what is needed to improve their conditions, and explore the possibility of creating some sort of union/cooperative. Discussion of Women in the Arts, organizing many generations of local women in any and all disciplines in the arts in order to share experiences, discuss the significance of our roles and strategize for more successful representation and visibility in the local arts community. Opportunities in Excess: An exploration of local excess and the opportunities they present to engage the circular economy and sustainability practices within art making. Image Theatre: Understand the Pillars of Economy, and then apply those pillars to compare the current economy built on extraction, exploitation, and enclosure to a solidarity economy based regeneration, cooperation, and ecological and social well-being by using theatre games and Theatre of the Oppressed techniques. Women of Color against Racism: Women of color talk about their experiences in Humboldt county. Societies for Poetic Action: Discover what a local, politically, environmentally and civilly engage art collective is doing to affect their community and see how you can get involved or gain inspiration for your own practice. Artist critique of strategic arts plan: Policy affects, in very concrete ways, how art is perceived and funded. Deconstruct, discuss, help develop a critique of how Eureka’s “Strategic Arts Plan” affects our creative community. The next Symposium will be in the Spring of 2018.